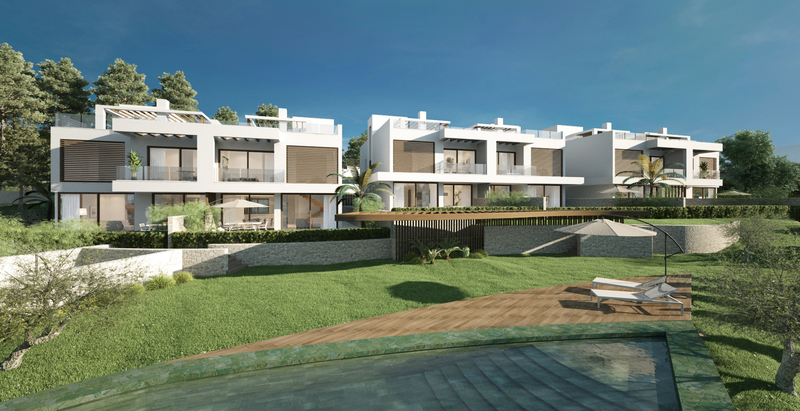 A boutique development of 6 semi detached luxury 4 bedroom contemporary residences in Artola, Cabopino with panoramic and picturesque views to the sea over Cabopino Golf and it’s fairway lined canopy of pine trees. Located just east of Marbella town, Cabopino is known for it’s natural beauty, pine forest and the famous Artola Beach which is widely regarded as one of the top beaches in Spain with golden sand dunes, exceptionally clean water and great beach restaurants. Cabopino’s stylish marina is just a short stroll away, and while smaller and more intimate than Puerto Banus, features an array of facilities including a wide choice of stylish restaurants, lounge bars and shops. Taking full advantage of the natural terrain, elevated position and proximity to the beach, all 6 residences boast stunning views of the sea from every floor. Distributed over 3 levels each residence has a wide array of features for luxury and contemporary living including; a private pool, personal elevator, rooftop solarium, double-car underground garage and large stylish walk-in dressing rooms also with sea views. The community features lush gardens with a beautiful pool area and is securely gated around it’s perimeter.